The most common question out there in life nowadays stands as this: Do you eat to live, or live to eat? My pick is the latter which is why on occasional day, I would pick out places that serves food that's a little different from the usual taste of chicken rice and fried koay teow. I first heard of this place from Tania or Isabel; I've forgotten and we've been planning since months ago to drop by for a visit because everything sounded really good when we read reviews that people had posted. Our visits never materialized until last Thursday when we thought we've had enough waiting and just went ahead with our long wait for good food. Epicuro's table mat, while not environmental friendly does makes for an interesting food photo backdrop. 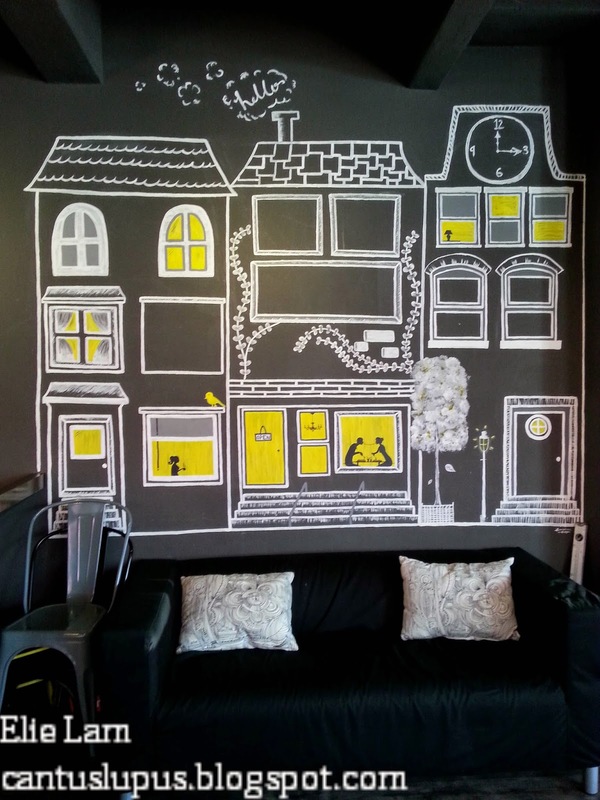 A cozy area purely for pictures and nothing else. I like the drawing though. 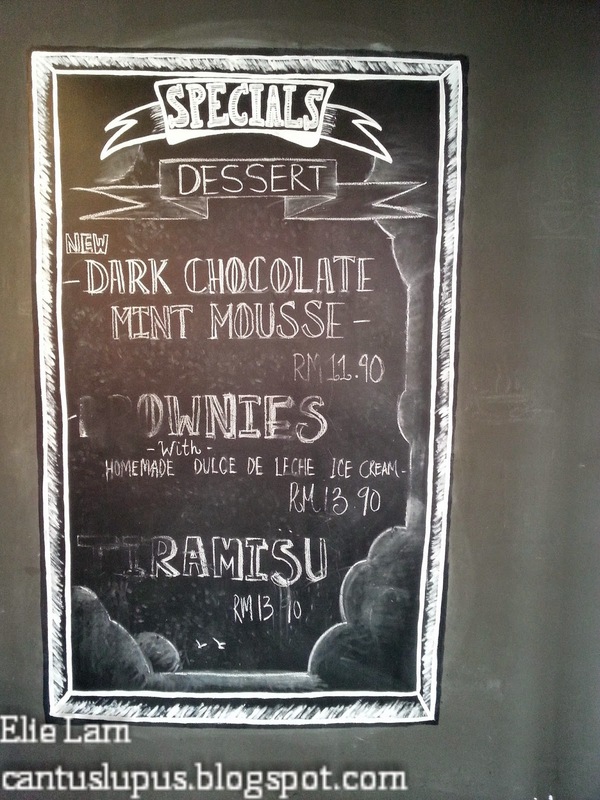 Specials are also written on the blackboard in what I presume is chalk so they can erase it from time to time and change on menus. Like every other eateries places that I visit beforehand, a brief read up is always good so I don't pick the wrong foods and shout profanities over something that isn't delicious. I mean, I did pay good money for this and I wanted it to be worth something! 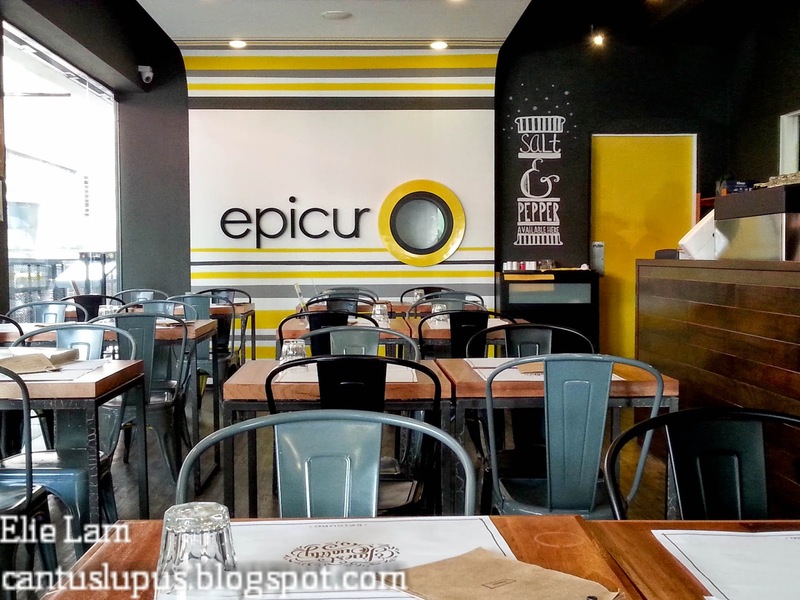 We were also lucky enough to have been at Epicuro during their lunch promotion whereby you could pick a main and get a free glass of iced lemon tea or top up RM 5 for a milk based coffee or tea from the teapigs selection. A choice of black coffee is also available for RM 3 instead. 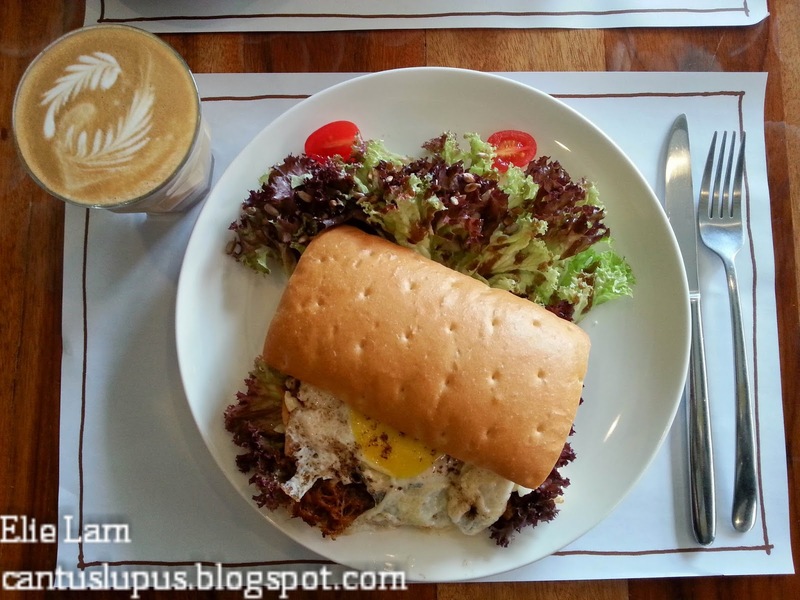 Lunch for the day: Pulled pork sandwich with a sunny side up and latte with an extra shot. With a price tag of RM 16.90 (If you ask for it without the egg, it's RM 15.90! ), this is definitely something that every sandwich lover should order. 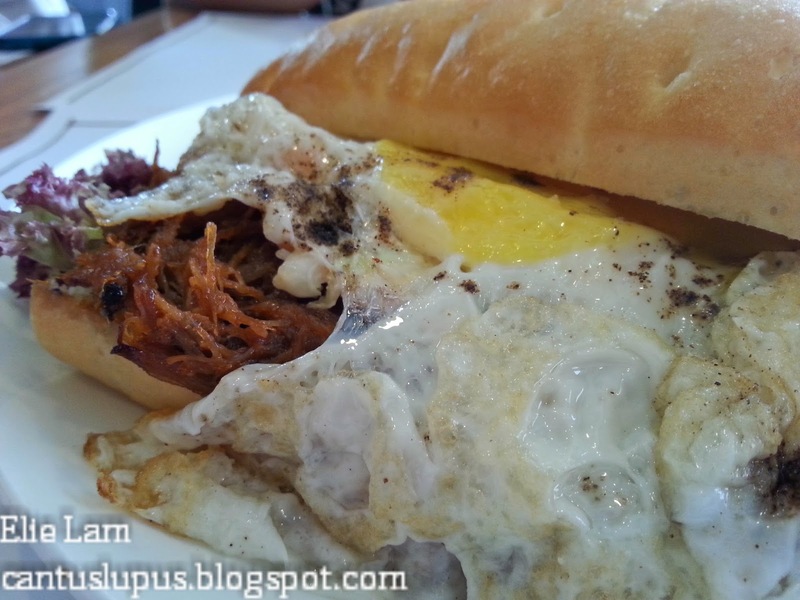 Ingredients were abundant and the sunny side up was served just atop the perfectly lean pulled pork, lying in between a piece of fluffy bun that wasn't overly dry nor was it soggy to death. The pulled pork had just a hint of spiciness to it, making it just right when you want something to give your tastebuds a good run on. In the end, this did not disappoint and I am glad because it's decently priced and when compared to other eateries that serves chicken sandwiches, the pulled pork sandwich in Epicuro is perfect. Spaghetti Carbonara with bacon bits and a slow poached egg. 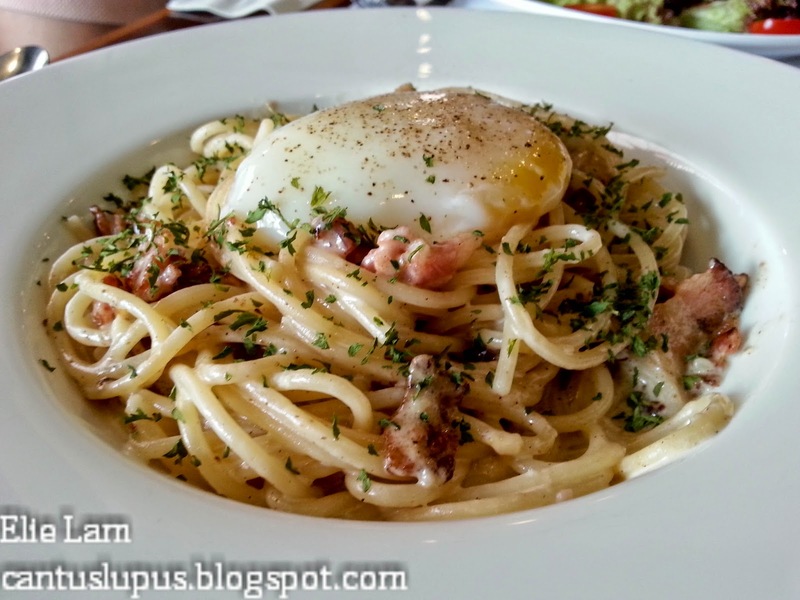 As mentioned in her blog post before, Tania finally tried out the Spaghetti Carbonara (RM 18.90) that Epicuro had to offer and true to what she had heard, it was really good. The cream sauce while thick was not at a gooey-ly disgusting state at all and you don't get sick of digging in like other carbonara dishes. The bacon bits were also a good accompaniment to the runny egg that gave the carbonara an authentic kick for lovers of this creamy goodness. We've been told time and time again that this was a great pick at Epicuro and we found out why on Thursday. As the name suggests, the cream is made of fresh spinach, giving it the unique green colour that you'll usually find in pesto sauces but it didn't have the "vegetable" smell as I call it. While I only had a little mouthful of the conchiglie with spinach cream, I thought it was fairly good and is somewhat a twist from regular pasta dishes whereby you'll have tangliatelle or spaghetti because conchiglie was used. 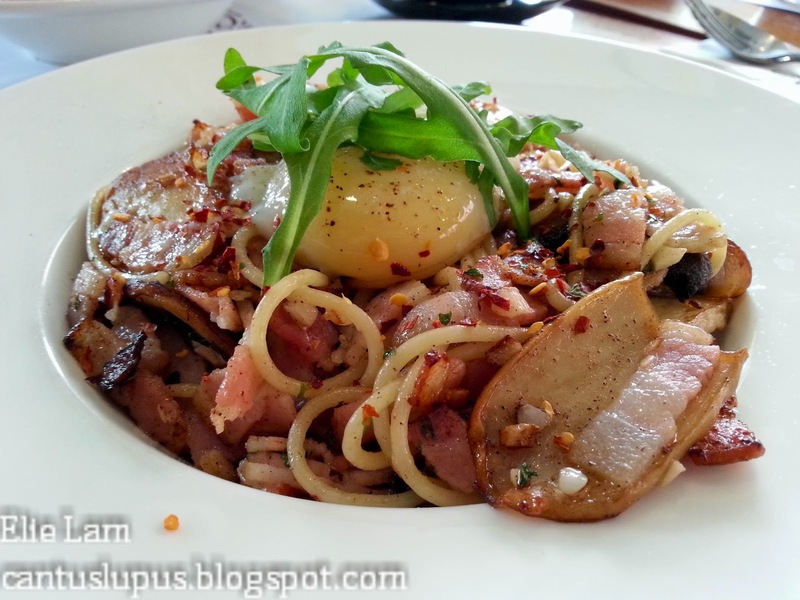 It serves at RM 19.90 but for the load of bacon bits it comes with, it's quite worth it. Mixed mushrooms & bacon bits aglio olio. For those who don't know, aglio olio is usually served with nothing but olive oil and garlic so you get that fragrant scent of sauteed garlic and nothing but. Epicuro's version of mixed mushrooms and bacon bits aglio olio (RM 20.90) takes a twist to that, throwing in brown mushrooms, king trumpet mushrooms and bacon bits with rocket leaves to give it that fine scent and tasty bite to every swirl. 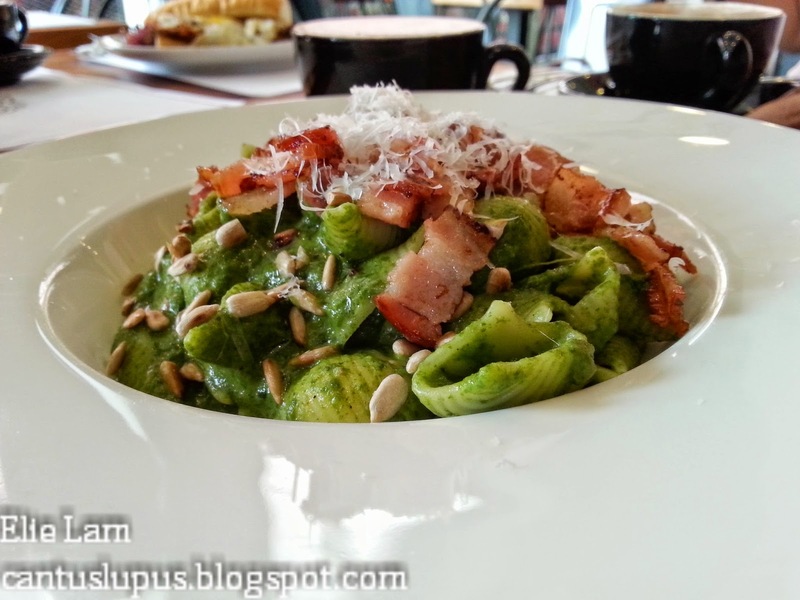 I won't lie, I loved this better than the other pasta dishes we had on the table that day. Isabel did think it was a little salty towards the end however so that should be taken into account. For RM 1.50, she also got a poached egg on top but found that it didn't go too well so that's an experiment done and will never be repeated again. Brownies with homemade dulce de leche ice cream. While I initially thought (And remembered) dulce de leche as caramel, a quick search showed that it was actually sweetened milk that's been prepared carefully by heating and is a result of the Maillard reaction of the product hence the change in taste and colour that resembles that of caramel. All the same, the brownies with homemade dulce de leche ice cream (RM 13.90) in Epicuro should be on your must-order list if you're visiting the place. 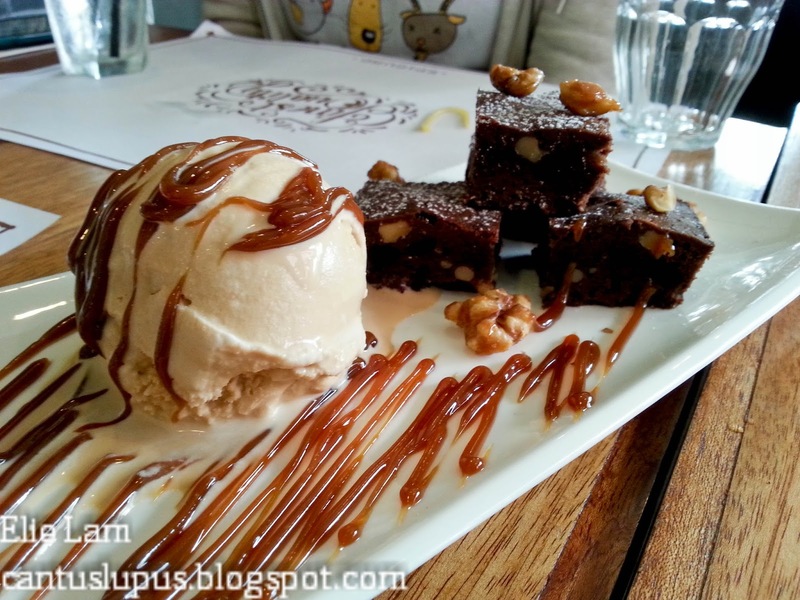 The slightly warm and nutty brownies that had a crispy top and chewy bottom paired perfectly to the dulce de leche ice cream that was slightly salty yet sweet to finish with a cold end. Seriously people, no meal is complete without desserts. 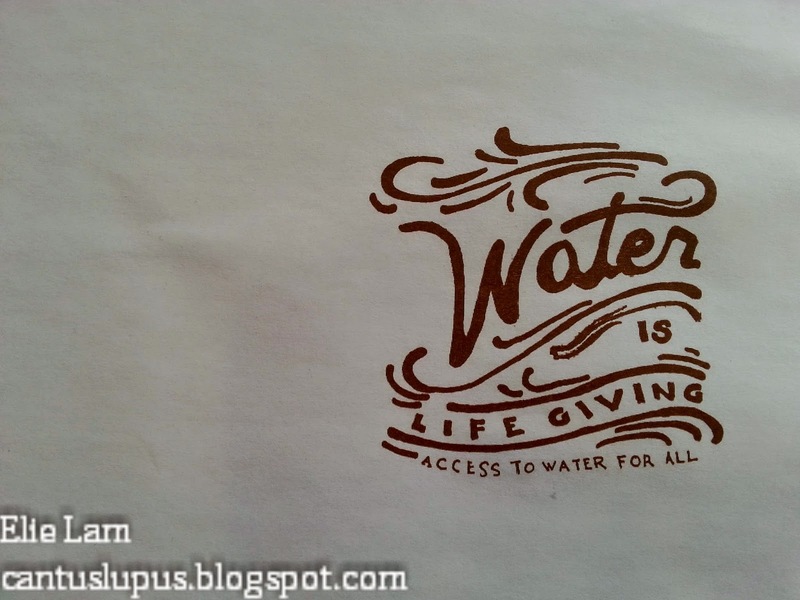 In other words, free water. Our meal ended on a high note to...water. I guess even with great food you should always down it with water so you don't leave with an overly bloated stomach and a mouth that feels like you've just thrown in anything you could find. Water comes by the bottle in Epicuro (As does most eateries right now) and is free for everyone. Now, is Epicuro worth a visit? Yes. Is it worth a revisit? Yes. 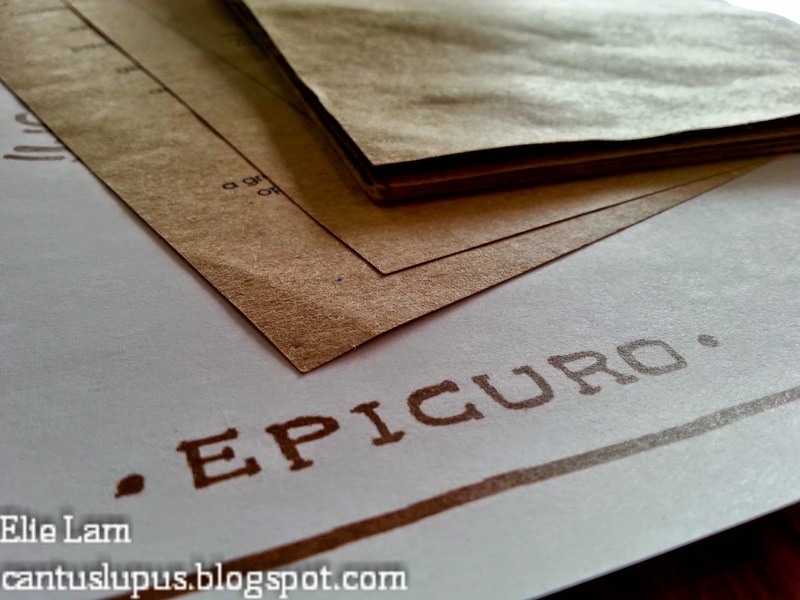 There are lots more dishes on Epicuro's menu in actual fact, and they all sound just as delicious as it prints on the brown paper. Remember though, that Epicuro may be packed on weekends and other peak periods so reservations are always recommended. P/S: They are facing the LDP with landmarks such as A Pie Thing, Maybank and CIMB Bank being on the same row. The key to Epicuro is also their neighbour; a hardware store with a huge plier hanging outside. Reservations can be made at 03 - 7733 3110 or via their online form here.